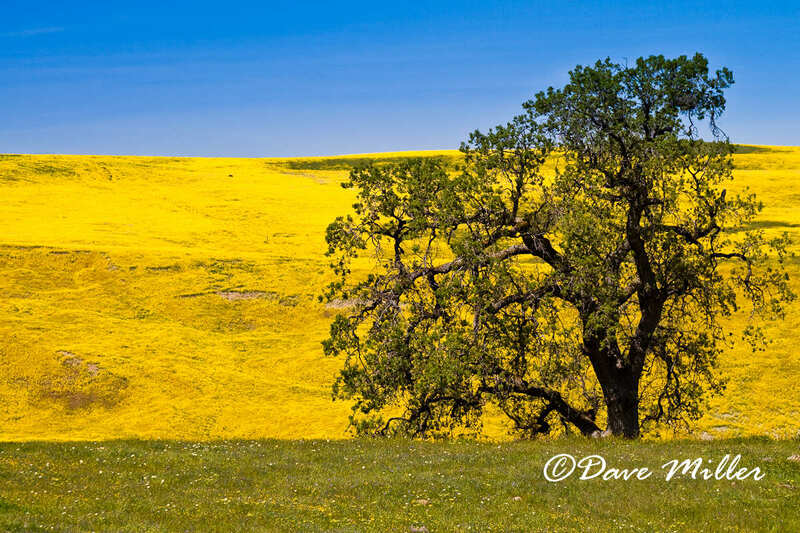 As many who know me know, I keep a pretty busy schedule and for the past several years as springtime approached, I never forgot about the photo, but also never tried hard to find this elusive spot. Last year I had a successful wildflower expedition along the Merced River Canyon and Hite's Cove Trail, and as spring approached this year, I was certainly looking forward to more poppies and Yosemite. I warned my wife and boss (the one at work too) that I was planning on taking time off work when conditions were right for wildflower season. 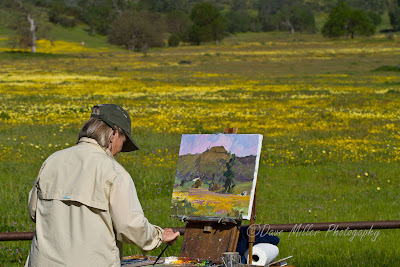 The rains kept coming and in the beginning of March, I started doing research checking out Carol Leigh's Wildflower Hotsheet and Theodore Payne Wildflower Hotline. I still was planning on a trip back to Hite's Cove, but the reports further South were more encouraging. I started thinking again about how "God Spilled the Paint" and decided that this was the year I may venture south and try to have my own colorful experience. I started to research the aforementioned photo and found it was taken in the Temblor Range and that the Temblor Range (pictured left) was located on the eastern edge of the Carrizo Plain National Monument. 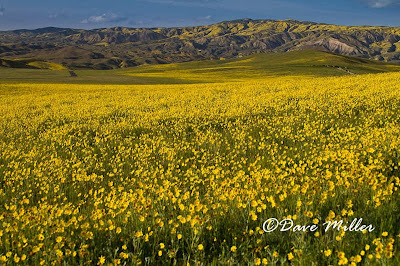 The best part about that, was the promising reports about Carrizo Plain that were popping up and even more, fellow hiker and Backpacker friend FourWheelBob was planning a trip to Carrizo and I was welcome to join him and the other Backpacker.com forum followers for the weekend. A week out, my plan was set, Thursday was to be a day trip to Hite's Cove, the rest of the weekend, Carrizo Plains and the Temblor Range. 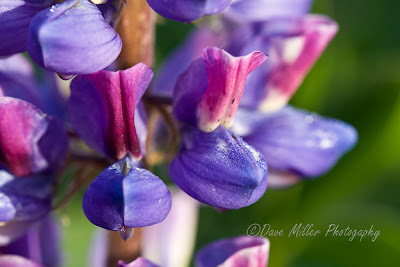 Every day I looked at the latest Wildflower reports and my plans changed daily too! On Tuesday, I saw some photos from Hite's Cove and it really wasn't close to what I experienced there last year. 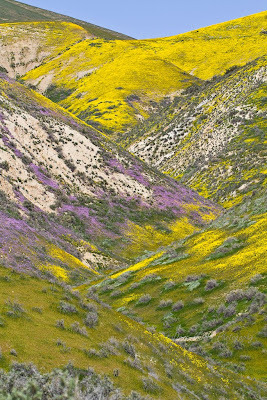 I also read a very promising report from another photographer, Andrew from lightandpictures.com, about a location near Carrizo called Cottonwood Canyon (pictured right). 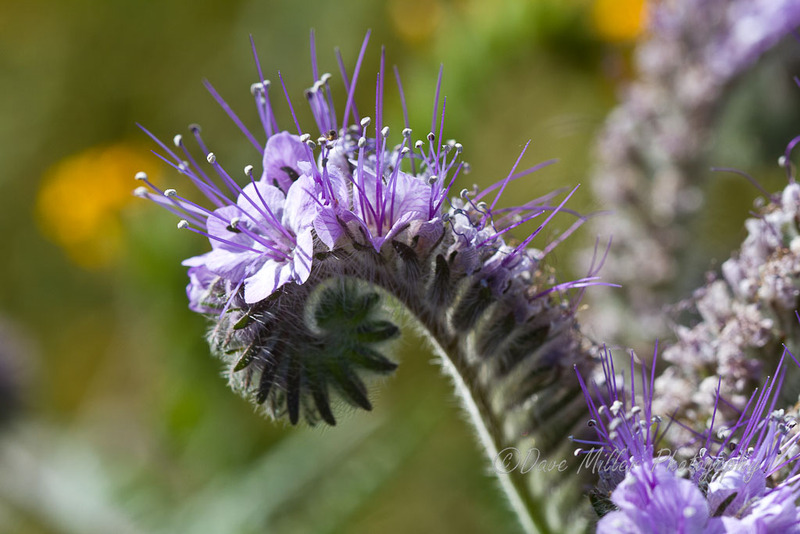 I emailed Andrew and he strongly encouraged me to check out Cottonwood Canyon and after seeing his photos, I agreed. 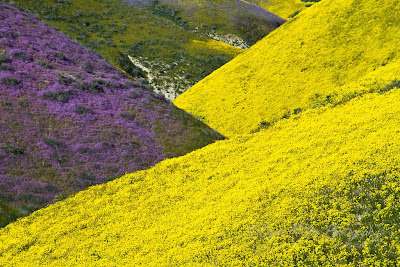 So, two days out, I decided to ditch Hite's Cove and Yosemite to focus on the southland. 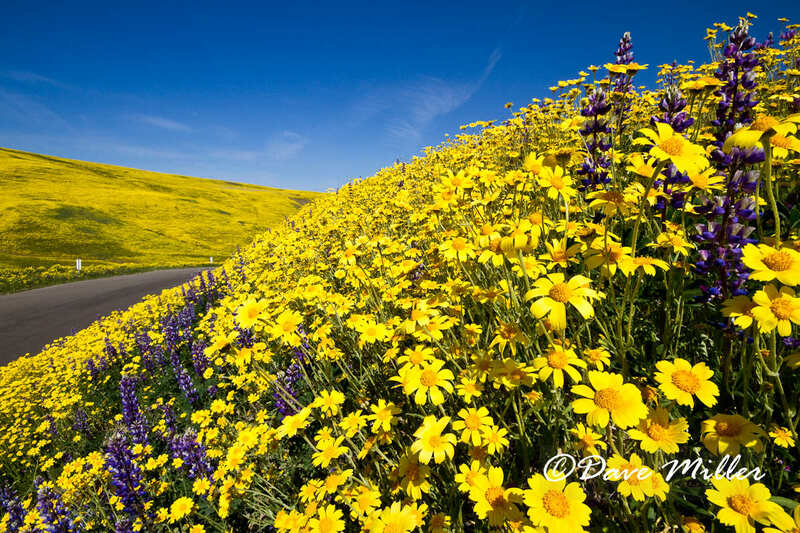 With camping and camera gear loaded up (and plenty of junk food), I headed out 0-dark-hundred and in what seemed like no time (4+ hours) I was with camera in hand on the corner of Shell Creek Rd and HWY 58 (Tidy Tip pictured left) taking in lots of flowers and color. I moved on and slowly wound my way to Carrizo Plain with lots of expectations. 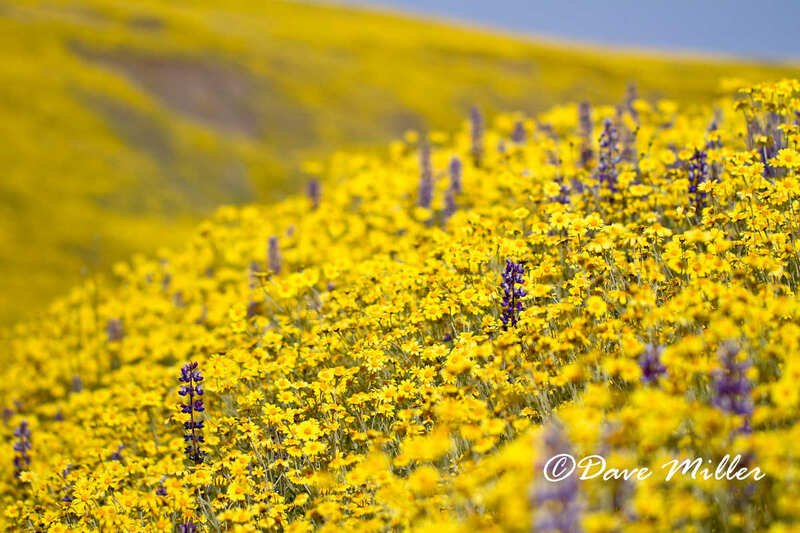 When I arrived, I was blown away with all the color and flowers, not just in the plain, but the hillsides surrounding the Carrizo Plain and Soda Lake were covered with bright yellow and splotches of purple. Somewhere out there in that color was where "God Spilled the Paint". What I didn't realize was that the Temblor Range, right in front of me, was over 20 miles long and seemed way off in the distance, a colorful distance, but still a ways away. I set up camp and headed to Cottonwood Canyon for the late afternoon light while checking out the possibilities along Soda Lake Rd for the rest of the weekend. Cottonwood Canyon and the Caliente Range along HWY 166 was awesome and just about everything Andrew had said it was. 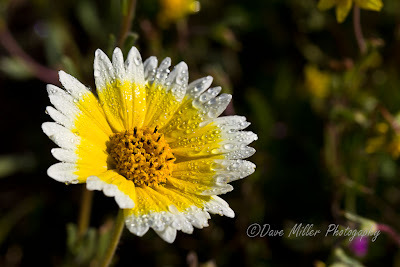 Friday, I focused on Carrizo and started out photographing a cool barn in early morning light, then headed for an expansive field of Hillside Daisies (Monolopia, pictured left). 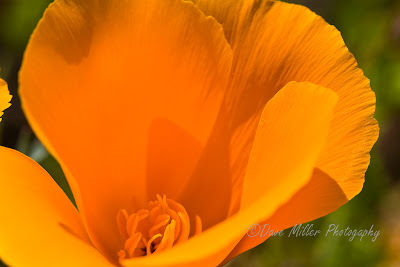 The wind was picking up which always makes it challenging for photographing flowers, but I managed to deal with it! My plan for the day was to explore and just see what I could see. 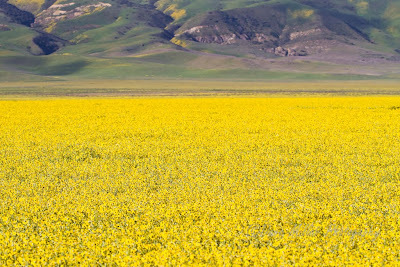 I kept eying the Temblor Range as I headed out towards Soda Lake. 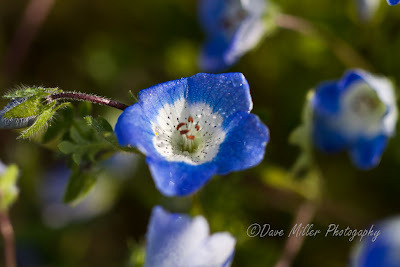 I found plenty of places to stop and try out my new Macro lens and photographed plenty more Hillside Daisies and phacelia (cool purple flowers) and Tidy Tips and Lupine and Baby Blue Eyes and many more. Gradually, I was heading east and getting closer to the Temblors. They were taunting me with purples and bright yellows and a little orange here and there. 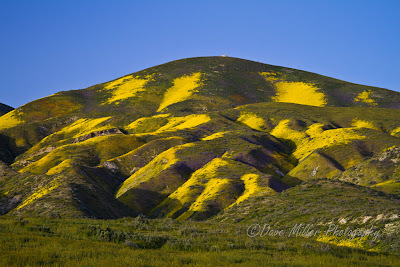 I made it to Elkhorn Road which follows near the base of the Temblor Mountains and started venturing the many narrow offshoots leading closer to the the tempting colors higher up to the east. The first road I took ended at a locked gate but I was still too far away to really see "God's Paintbrush" as I wanted, so I found myself over the gate and left my car way behind to get up close and personal with the Temblor Range. It was thrilling! The CF card in my camera began filling up with views from a ridge just below a beautiful hillside. I knew this was nothing like what Frank Kee had seen, but was excited none the less. I made it back down to the car and journeyed south, taking every dirt road that brought me closer to the Temblors. Some vantage points were better than others, but one thing I noticed was the color was getting better! I managed to get on one side road that brought me up so close to the color that I was ecstatic. 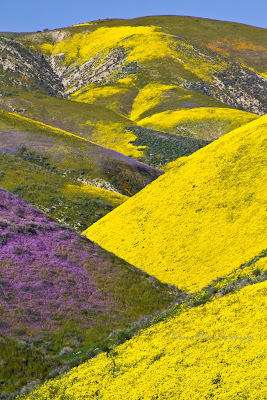 Not far above and in front of me was a series of ridge lines filled with deep, bright yellows (Hillside Daisies) to the right and an expansive purple (Phacelia) patch to the left. Time to put in a new memory card in my camera! I continued my journey south finding more great overlooks and vantage points of the Temblor Range. I was thrilled with what I had seen and captured and knew this trip was a success. I left Carrizo Saturday morning and headed out to discover more places (more to come later on that). God certainly spilled paint this year, like He does every year. I feel fortunate that I had a chance to get out there to see it. 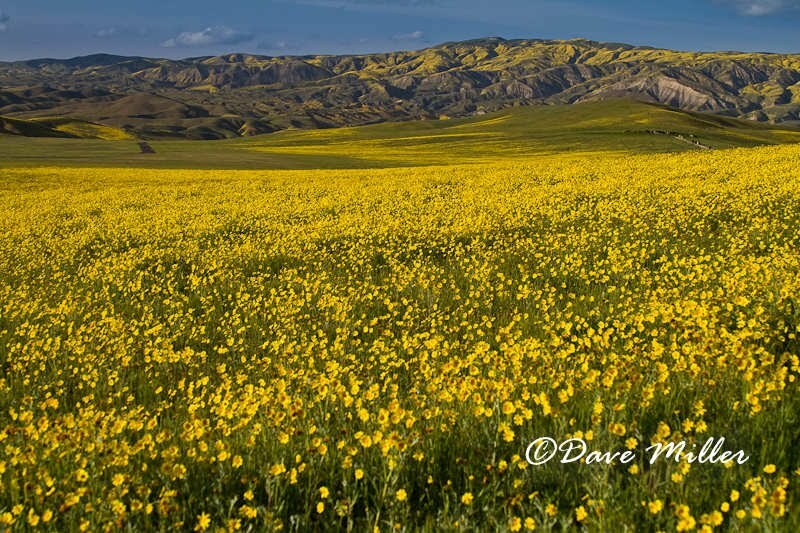 Notes to know before you go: There is no cost to enter the Carrizo Plain National Monument and camping is also free, but at a first come first serve basis. The campgrounds are rustic and dry. The standard vault toilets are available, but you need to bring in all your water and pack out your trash. The two main roads, Soda Lake Rd & Elkhorn Rd were mostly dirt roads but in good conditions. Conditions could quickly turn for the worst after a rain. For more photos, check out my Smugmug Gallery. Below is a map showing a variety of places I visited and more photos from the trip. Check it out! Feel Free to contact me if you have any question. Painter Anita Hampton at Shell Creek Rd. As usual your photos are breathtaking and astounding. Thanks for sharing. Excellent trip report and photos! We're heading down this weekend - hope the weather cooperates for some good shots too! Thanks All. It was a great trip and I had a tough time being brief. Amazing, thanks for sharing. Also headed there this weekend. 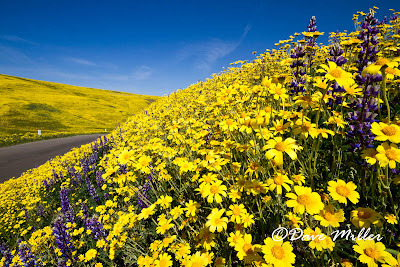 Sad to see that Carol Leigh took down her wildflower info http://www.calphoto.com/wflower.htm . Thanks for the google map and noting the Cottonwood Canyon private land. Ann, Have fun and I hope you get good weather. I feel for Carol right now. I think she made the right choice by shutting things down for now. I almost made more of a point about the issues at Cottonwood Canyon, but I wanted the focus of my article to be mostly on Carrizo. I went to Cottonwood twice on my trip, the first time on Thursday before any signs were setup and then on Sunday when I noticed the No Trespassing signs scattered over the place. I definitely saw people abusing the area and there were a lot there. I can't say I stayed on the road the whole time, but I definitely was careful of where I stepped and my surroundings. I was more conscious of it on Sunday after I saw the signs and made sure to stay close to the road. I'd love to year about your trip and the conditions one week later. Now I want to visit this area. Dave - It was a spectacular weekend! I think you had more color when you were there, or at least your pictures showed lots more purple-coated mountainsides than I recall. But as far as I could tell, it was still going quite strong. We only got to Shell Creek Rd (where there were a few parties spread with blankets atop the flower fields :(, Soda Lake Overlook, and drove to some points near the Temblor Range on Elkhorn. Your google map helped a lot. Did you take some of the pictures from a hike from Wallace Creek? We were looking for the road you may have taken to your favorite Temblor Range vantage.. only road we thought could have been it seemed to be a service road near the power lines. Would love to hear if you make it out to Hite Cove or Merced .. sadly, not sure if i can make it that way until I go for wedding in Yosemite in mid-late May. Glad you had a chance to make it out there. One of the side roads did follow the powerlines and went pretty far up to the base of the hills. I'm pretty sure that was the location of my favorite spot. They all blend together after a while! 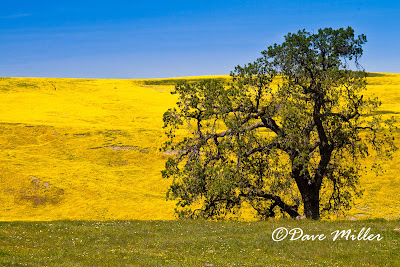 I did do a Wallace Creek hike and a couple photos may be from there. I mapped the hike for Backpacker Magazine web site. Hopefully I'll get the trip report done soon and submitted. I'm going to try to do Hite's Cove later this month. 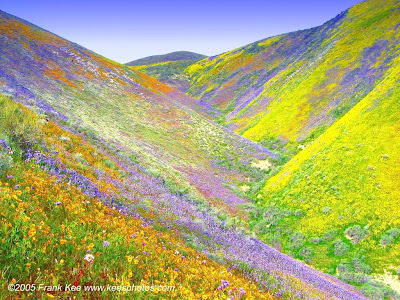 It will be well beyond the wildflower peak, but it's a good hike anyway. I'll post the hike though. gorgeous post! Thank you for sharing all the beauty you are finding. Your photos are grand and precious. Thanks Tammie for your kind comments. It is a joy to capture what God has given us! Take care! Wow, excellent pictures. Would the third week of April be too late to experience this splendor? If you had just one day to visit the area (including driving down from SF), which parts would you recommend going to? Thanks in advance. I don't believe that the Carrizo and Temblor Range will have the same displays of color in late April as when I was there. This was my first trip down that way and I'm not very familiar with the area, but usually displays like that only last a couple of weeks. The weather plays an important part. 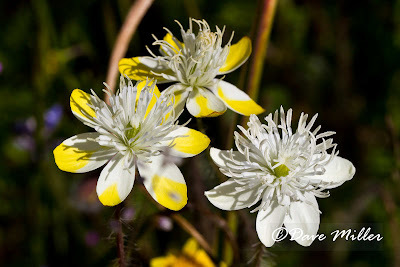 I would check the Theodore Payne Wildflower Hotline (there's a link in my post) for the latest wildflower conditions. 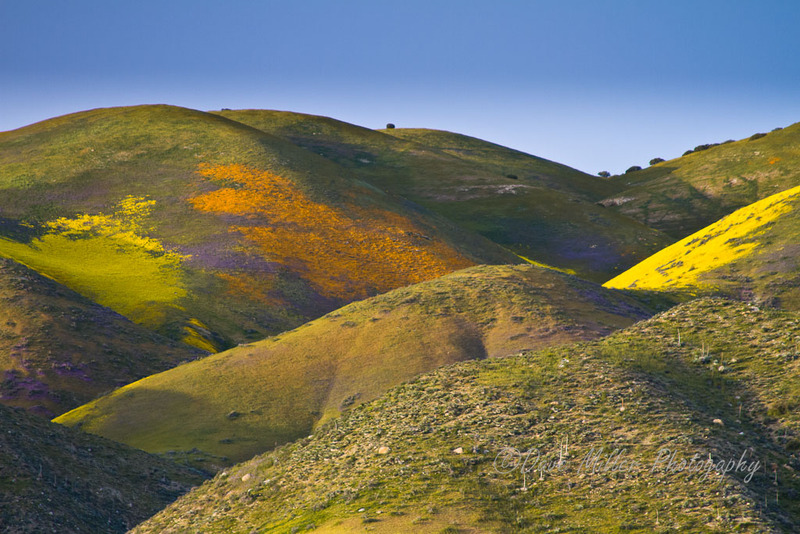 You will notice the hills don't have as much color, but the plain is lit up. I did not see those colors when I was out there. It is difficult for me to list one place to visit for a day because it would depend on the weather and conditions. My plans often change last minute so I can try to be in the right place at the right time. I try to have backup plans too just in case things aren't what I thought when I got there. Some of my favorite places to go are Pt Reyes and Yosemite, but if the wildflowers were still strong in Kern County, that's tough to beat. Keep doing your research and I know you will find something spectacular this time of year. Let me know what you end up doing and how it went. Great pictures, I've been there in the winter and summer but never in the spring. I would really love to see the flowers this year and I was wondering if you could tell me the location of the place with the tree in it? I really like that place and hope to visit it this upcoming year.